As a reporter in Atlanta, it is a must to understand all that the city has to offer. Whether it is something that is a common source for discussion for travelers, Hartsfield Jackson International Airport, or whether it is one of the worst intersections in the southeast due to drugs and HIV, also known as The Bluff, reporters must not shy away from topics that are often seen as infamous. 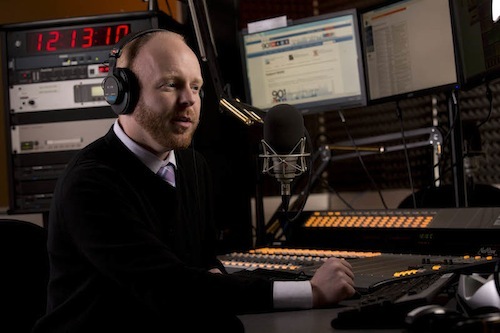 Jim Burress is a reporter and producer for the Atlanta station of National Public Radio (NPR), called WABE-FM, and has covered both of these topics. He is a regular contributor to the show, Marketplace, and also had stories air on NPR’s shows Morning Edition, All Things Considered and Day to Day. Burress is credible in the Atlanta media scene and is coming to the University of West Georgia’s Media Day on March 5 to contribute to the panel and networking sessions. Burress grew up in Louisville, Ky. and started his media career in high school after attending an audition for local teenage hosts at the NBC station. Before he landed the spot of teen television host, Burress knew he wanted to join the media industry because he wanted to make an impact on an audience. Recently, Burress got the chance to make an impression on his audience when he wrote and produced a radio documentary called Stuck in The Bluff. He tells the story of a non-profit called Atlanta Harm Reduction Coalition (AHRC) that travels into The Bluff to do something that is illegal in Georgia, exchange used needles for clean ones, something that is only allowed by a doctor or pharmacist. Burress followed the group around and recorded first hand accounts from AHRC volunteers and the people who utilize them. Seeing as AHRC was operating an illegal needle exchange to prevent the spread of HIV, Burress said that the amount of arrests, or lack thereof, for giving out clean needles, was surprising. After learning about this, Burress went to an Atlanta police officer to ask him why the Atlanta Police Department never arrests anyone even though AHRC doesn’t hide what it’s doing. When asked, the officer had to ask Burress about the law. Burress said that obstacles like he faced when talking to the police officer are just some of the things journalists have to deal with. He said that making sure you are going into this field of work for the right reasons would make it a worthwhile job, not just for the glam that often comes with working for the media. Burress praised the media field and said if someone has a passion to do it, then it is the most fulfilling career he could think of.